Choline is an essential nutrient that serves as a building block for important molecules including acetylcholine, an important neurotransmitter, and phosphatidylcholine, a phospholipid with anti-inflammatory and pro-longevity effects.1,2Choline serves as a source of carbon, and is an important facilitator of methyltransferase reactions, which are involved in gene and protein regulation across many areas including inflammation. Choline supplementation is known to be associated with preventing neural tube defects when taken by pregnant mothers, as well as for improving metabolism in regards to lipolysis and development of metabolic syndrome.3The most widely used nootropics serving as choline sources include CDP-choline and α-GPC (L-Alpha glycerylphosphorylcholine). There are no reported major side effects of choline when taken within normal limits. Acute choline administration has been shown to improve working memory in some individuals. One double-blind crossover study found that choline administration did not result in significant changes in spatial or working memory. 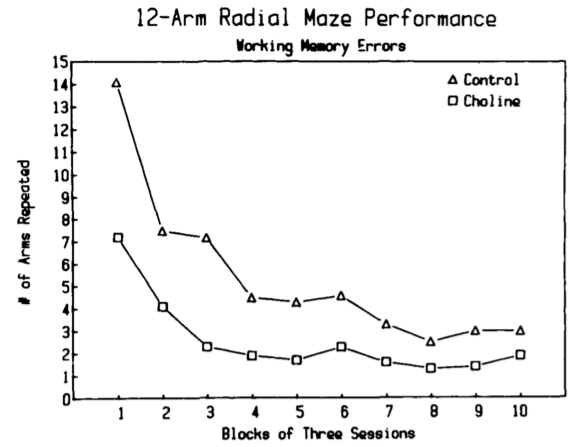 Pre-natal and post-natal long term supplementation with choline improved spatial working memory in rats (tested with the radial maze task). Choline is a compound consisting of a two-carbon chain in which one end has a hydroxyl group attached and the other has an amine nitrogen. Choline can be supplemented from several different sources. Popular choline sources include α-GPC, but also choline bitartate and CDP-Choline. By weight, choline represents 40% of α-GPC by weight, 18% of CDP-choline by weight, and 40% of choline bitartate by weight. Choline bitartate, which is inexpensive, is not as bioavailable as α-GPC or CDP-Choline and cannot cross the brain-blood barrier. 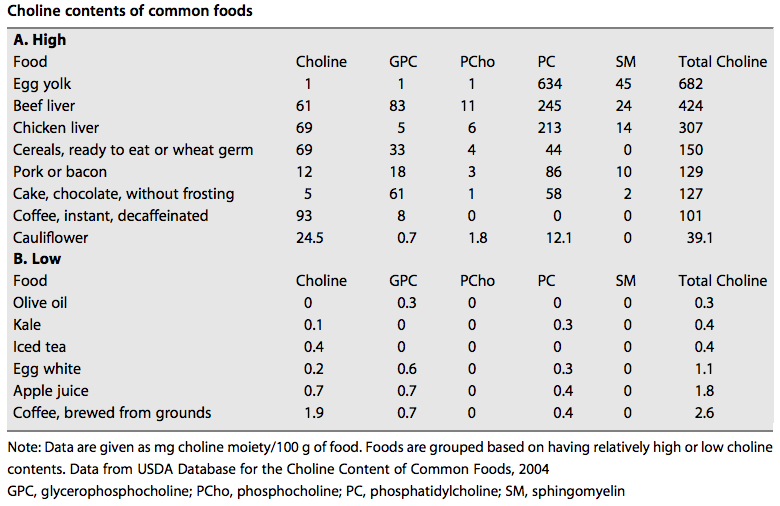 CDP-Choline is less efficient delivery mechanism of choline by weight; one needs to take more than twice as much CDP-Choline than α-GPC to get the same amount of choline. Common foods that contain high amounts of choline include egg yolk, beef liver, chicken liver, cereals, pork, coffee, and cauliflower. Sources of choline. Measurements are given in mg choline / 100 g of food. This is clinically important because there is a large body of research suggesting that learning, memory, intelligence, and mood are mediated at least in part by acetylcholine metabolism in the brain.16This effect is commonly referred to as the "cholinergic effect". Normally, acetylcholine binds to cholinergic receptors the central and peripheral nervous system. Increased binding to the cholinergic receptors has been implicated in memory. The recommended daily amounts of choline for adults over 19 years of age are 550 mg/day for males and 425 mg/day for females.1Research has shown that supplementation with up to 300 mg/day may carry cognitive benefits in attention and memory. We recommend a daily supplementation of around 300 mg/day in the form of α-GPC or CDP-Choline. Wurtman, R. J., Cansev, M., & Ulus, I. H. (2009). Choline and its products acetylcholine and phosphatidylcholine. In Handbook of neurochemistry and molecular neurobiology (pp. 443-501). Springer US. Blusztajn, J. K., & Wurtman, R. J. (1983). Choline and cholinergic neurons. Science, 221(4611), 614-620. Ueland, P. M. (2011). Choline and betaine in health and disease. Journal of inherited metabolic disease, 34(1), 3-15. Bartus, R. T., Dean, R. L., Beer, B., & Lippa, A. S. (1982). The cholinergic hypothesis of geriatric memory dysfunction. Science, 217(4558), 408-414. Poly, C., Massaro, J. M., Seshadri, S., Wolf, P. A., Cho, E., Krall, E., ... & Au, R. (2011). The relation of dietary choline to cognitive performance and white-matter hyperintensity in the Framingham Offspring Cohort. The American journal of clinical nutrition, 94(6), 1584-1591. Richter, Y., Herzog, Y., Eyal, I., & Cohen, T. (2011). Cognitex supplementation in elderly adults with memory complaints: an uncontrolled open label trial. Journal of dietary supplements, 8(2), 158-168. Meck, W. H., Smith, R. A., & Williams, C. L. (1988). Pre‐and postnatal choline supplementation produces long‐term facilitation of spatial memory. Developmental psychobiology, 21(4), 339-353. Ulus, I., Arslan, B. Y., Savci, V., & Kiran, B. K. (1995). Restoration of blood pressure by choline treatment in rats made hypotensive by haemorrhage. British journal of pharmacology, 116(2), 1911-1917. Savci, V., Goktalay, G., Cansev, M., Cavun, S., Yilmaz, M. S., & Ulus, I. H. (2003). Intravenously injected CDP-choline increases blood pressure and reverses hypotension in haemorrhagic shock: effect is mediated by central cholinergic activation. European journal of pharmacology, 468(2), 129-139. Damaj, M. I., Meyer, E. M., & Martin, B. R. (2000). The antinociceptive effects of α7 nicotinic agonists in an acute pain model. Neuropharmacology, 39(13), 2785-2791. Zeisel, S. H. (1992). Choline: an important nutrient in brain development, liver function and carcinogenesis. Journal of the American College of Nutrition, 11(5), 473-481. Hasegawa, T., Matsukura, T., & Ikeda, S. (2010). Mesotherapy for benign symmetric lipomatosis. Aesthetic plastic surgery, 34(2), 153-156. Rotunda, A. M., & Kolodney, M. S. (2006). Mesotherapy and phosphatidylcholine injections: historical clarification and review. Dermatologic surgery, 32(4), 465-480. Tazaki, Y., Sakai, F., Otomo, E., Kutsuzawa, T., Kameyama, M., Omae, T., ... & Sakuma, A. (1988). Treatment of acute cerebral infarction with a choline precursor in a multicenter double-blind placebo-controlled study. Stroke, 19(2), 211-216. Parnetti, L., Mignini, F., Tomassoni, D., Traini, E., & Amenta, F. (2007). Cholinergic precursors in the treatment of cognitive impairment of vascular origin: ineffective approaches or need for re-evaluation?. Journal of the neurological sciences, 257(1), 264-269. Hasselmo, M. E. (2006). The role of acetylcholine in learning and memory. Current opinion in neurobiology, 16(6), 710-715. Tang, Y., Mishkin, M., & Aigner, T. G. (1997). Effects of muscarinic blockade in perirhinal cortex during visual recognition. Proceedings of the National Academy of Sciences, 94(23), 12667-12669. Blokland, A., Honig, W., & Raaijmakers, W. G. (1992). Effects of intra-hippocampal scopolamine injections in a repeated spatial acquisition task in the rat. Psychopharmacology, 109(3), 373-376. Elvander, E., Schott, P. A., Sandin, J., Bjelke, B., Kehr, J., Yoshitake, T., & Ogren, S. O. (2004). Intraseptal muscarinic ligands and galanin: influence on hippocampal acetylcholine and cognition. Neuroscience, 126(3), 541-557. Rogers, J. L., & Kesner, R. P. (2003). Cholinergic modulation of the hippocampus during encoding and retrieval. Neurobiology of learning and memory, 80(3), 332-342.